Me and Arthur Geisert, Arthur Geisert and I . . . I wouldn’t say we've ever connected, exactly. Over the years I’ve had a hard time getting a grasp on his particular brand of picture book creation. I’m a librarian. I like categories and slots and easy ways to organize my thoughts on one person or another. Geisert sort of rejects that whole idea. His picture books work in and of themselves, but they don’t pander. You don’t pick up a work by the man and feel that it’s trying to ingratiate itself with you. There’s something vaguely unnerving, almost European, about this. We Americans are used to books dipped in glitter and outrageous characters that scream across crowded bookstores and libraries, “PICK ME!!! PICK ME!! I’M THE ONE!!! !” Arthur Geisert books, in comparison, sit quietly in amongst themselves playing a hand of Pinochle or, if they’re feeling particularly daring, maybe a round of Hearts. Should you choose to pick one up to read, it will tip its hat politely to you but make no attempt to smoother you with its marvelousness. All this came to mind when I read one of Geisert’s latest creations. Ice is a simple story focusing on pigs and glaciers. On long horizontal pages, our wordless tale begins with a look at an island. The sun sits big and low over a series of adapted huts. At one end of the island sits a kind of pit or pool, low on water, where the resident pigs fill up their buckets. That night a conference is called and next thing you know the pigs are hoisting the rigging on their one and only ship. Not content with mere sails, a balloon is inflated and off go the pigs. Soon enough they locate some enormous glaciers. Enterprising to the last, they connect their ship to one such ice chunk (sails are added to help drag it along) and when they return home the ice is put to use. The bulk is added to the pool, but even smaller squares can be put to good use when they become impromptu air-conditioning aids. By the end, the pigs are happy yet again, and the hot days are tempered at last.Periodically I’ll get folks in my library looking for wordless picture books. There are a number of ways of meeting that need. For my part, I’ve whipped up a little list of our best wordless books (Mirror by Jeannie Baker, The Red Book by Barbara Lehman, Flotsam by David Wiesner, etc.). If I knew Geisert better I could attest as to whether or not he is accustomed to visual narratives. If I were to take a guess though, I’d say he’s done this before. This isn’t one of the easier wordless books, though. It makes you work. When first you see the deep pool, low in its water supply, it’s not immediately apparent what is going on. The pigs throughout the story are pretty good natured about things. When they decide to set out for some ice, there’s aren’t folks who object to this notion. It seems the logical next step, though the reader doesn’t know what’s going on until much later. Geisert makes it evident that if you stick with the story, all will be revealed in time. That’s a lot to ask of the child reader that's used to action in every scene. For the quieter, curious type, however, the ultimate payoff is its own reward.Geisert’s illustrative style uses etchings, always and forever. This allows him to create scenes filled with lots of little details. Read the book more then once and you’ll begin to notice all kinds of things you missed on a first run, like the fact that the female pigs do just as much of the work as the male pigs. I didn’t really notice this at first, noting only that the girls wore dresses and the boys wore overalls. But a second glance showed me the women sawing away at the ice, or helping to lug it across the island. It’s subtle, but then so’s the book. The lovely use of watercolors to fill in the spaces doesn’t hurt matters much either.Now let’s say you want to give a kid a book on the circle of life and how living things rely on nature and ecological balance. All that good stuff. Well, there’s no shortage of didactic, preachy, not particularly good environmental books for the kid set. Ice could fall into the ecologically sound category of children’s fiction, though. Sure it could. It doesn’t take much stretching of the imagination to see how the pigs’ lives rely entirely on finding glaciers to lug back to their home. It’s interesting to note that they live on what is essentially uninhabitable land. The only way to exist there is to regularly go out and find ice. That said, one almost gets the feeling that these pigs have lived on this island for hundreds of years. They could leave at any time, but this is their home and they’ve adapted to it. Should the ice go away . . . well it doesn’t bear thinking about. Look at the cover of this book. It took me a little while to notice but it’s set up very much like a professional photograph. 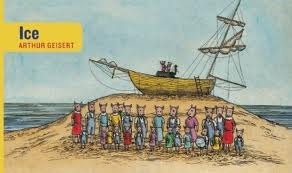 Here are all the pigs in the village standing proudly in front of their boat. Two pigs are perched on the cabin of the boat itself, waving in the distance. Some pigs are boldly smiling at the camera. Others are stiff and formal, as if unsure how to act. These are our characters. This is a community. This is an extended family that may have once arrived on this island on that boat, but decided to stay for a reason. There’s no going back for them and indeed life seems pretty good. Cheers then to Mr. Geisert for coming up with such a strange but wonderful little wordless title. I’d pair it with the books of Elisha Cooper (Farm,Beach, etc.) for a similar subdued but cleverly illustrated off-kilter style. Don’t be fooled, though. Ice really isn’t like any other book out there. Consider it delicate and delightful.For ages 5 and up. The fun in this wordless picturebook is just answering the question: What are these pigs up to now? Once I realized what they were up to, then it was: How will they do it? Panoramic illustrations and a fairly distant zoom on the scenes makes each spread a rich experience with details to savor, and when paired with a short and wide trim size (10x6 inches) each spread feels larger. I’m glad Enchanted Lion is willing to take a risk with interesting formats and ideas! Didn't hit me. Maybe I would have liked it more if I could see the details in the pix without squinting. Maybe not. It's simple, resonant, quiet, subtle... all good things... but it just doesn't work for me. Fun little wordless story. Could use for STEM, solving problems. Ice- Wordless bookText to self connection: When I looked through the pictures of this book, I was having a fun time trying to figure out what the pigs were doing. Once I made it through, I thought, "Oh I get it, they're working together to live in the place they want to, even if they have to travel to get supplies." This reminded me of the time we built a shed in our backyard. My parents, sister, and I all took numerous trips to Home Depot and Menards to get all the supplies we would need, and my dad designed and built the shed. I can remember helping him by handing him nails and screws, holding things in place, and painting the finished product. Just like the pigs did in the book, we worked together to make what we needed to. The phrase "Many hands make light work" came to mind while reading this and reminiscing on my shed building adventures.Text to text connection: When I looked at the pictures, for some reason this made me think of "Gulliver's Travels". I think seeing the ropes the pigs used to tether their ship and move the ice made me remember when Gulliver was tied down on the island by the little people with ropes. Also, just the adventure aspect of traveling, using a map, and going somewhere new helped me recall the novel.Text to world connection: This book is about a group (or colony I suppose) of pigs who live on an island and need to sail in a floating ship to get an iceberg for fresh water and cool air because their supply is running out. They work together and bring the ice back to their island and are happy to be living comfortably again. This is a great illustration of what people have done all through the world throughout the history of the world. People live together in groups to sustain life and they move to new places to get the things they need to continue living just like the pigs did. People have always worked together to make their lives better and that is what the whole world does on a daily basis. In the wordless book Ice by Arthur Geisert, a group of pigs are living on a scorching hot, deserted island. Because of the extreme heat and sparse water supply, the pigs get creative and develop a plan for getting some ice. They place a balloon on the sail of their ship and float halfway around the world in search of ice. When they arrive in the artic, they attach an iceberg to their ship and turn around for home. When they return home, they fill their watering hole with giant chunks of ice, take a swim, have cold drinks, and enjoy the cool breeze of an ice cube sitting in front of a fan. Problem solved.In order to introduce this book, I would wait for a hot day. I would ask the students to brainstorm some ideas for ways to stay cool and write the list on the board (text-to-world). Then, I would share with them the pigs’ idea. I would also relate this book to Miss Piggy and how she sometimes comes up with some crazy ideas, just like these pigs (text-to-text).At the end of the story, as a closing activity, I would tell the students that we would need to do an experiment to see if ice really does help people stay cool. First of all, each student will need to write down his or her prediction or hypothesis. They will answer the question “Does ice help to keep people cool?” Then, each student will be given an ice-cold glass of lemonade. As they are drinking it, they will need to write down their process for testing their hypothesis. Finally, they will record their end result and how they measured it. Of course, this is not a very scientific study, but it gets them familiar with the scientific method. Ice by Arthur Geisert is an inventive wordless tale about pigs seeking ice that features adventure.A community of clever, inventive pigs on an island suffering from heat decides to launch their ship fitted with a hot air balloon to search for an iceberg. Finding an iceberg, they fit it with a sail and tow in back to their island where they cut it apart, pushing most of it into a water holding tank. Smaller pieces are used to cool sheds with fans or ice drinks. This wordless tale is told with Geisert's detailed etched illustrations. Full of detail, they feature Geisert's famous pigs. Both children and adults, male and female appear to help with the creative, inventive project which entails engineering expertise. These pigs are clever, creative, inventive problem solvers, who use natural resources to make their life more comfortable. This book showcases creativity, inventiveness, cooperation, and awareness of the environment. Ice could provoke discussion on all these topics. I recommend this book for school and public library collections. I was lucky enough to hear Geisert speak at a library when he still lived in Illinois. His books are always thought provoking and beautifully illustrated.For ages 5 and up, cooperation, invention, environment, creativity, pigs, and fans of Arthur Geisert. Iceby Arthur GeisertText-to-Self:In this book, it told the story of a community of pigs running out of water. They had little water left in the well and no water left at their homes. So they decided to go on an adventure to get a piece of an iceberg and bring it back to their community, which then provided them with a lot of water. I could relate this book text-to-self in saying that it is always important to go after what you want or, in this case, need. The pigs were in a bit of trouble, but they didn't just give up, they found out another way to get water and carried on with the plan. It has a good lesson of never give up.Text-to-Text:I could relate this book text-to-text by having a little bit of an animal and agriculture lesson. Pigs need water in order to live, so I could talk about the animal for a bit after reading the book and explain why it is so important for pigs to have a abundant water supply.Text-to-World:I could relate this book text-to-world by having a geography lesson with my students. The pigs traveled to the North Pole to get the chunk of the iceberg. I could put a map of the world up in my classroom and discuss where icebergs would most likely be located and why they are where they are. I liked the book ice but I felt as though it should be used for an older audience. There is so much going on in each picture and some of the things going on would be difficult for kindergarteners to understand. I think that second grade to about 6th would be appropriate. In relation to other books I have read this book while having no words has more going on than some books I have read with words. Relating this book to myself I am not as observant as I thought I was. There was so much I missed when looking at this book; I had to go through two times to catch everything that was happening. I probably still missed something! In relation to the world, ice is not realistic. This is a fiction book that makes you think about adventure. They went on an adventure half way around the world and enjoyed it so much just for a block of ice! This book would be great for having second or third grade think about an adventure they would like to go on and a weird way they could try to get there. For the older grades you could have them try and write a story about what is going on in this book so they really have to notice every little detail. -Ice by Arthur Geisert Copyright 2011Text to Text- This is like Chalk by Bill Thomson, a problem occurs such as running low on water or draws come to life and characters need to come up with a creative to problem solve. In Chalk they draw a rain storm to wash away their draws while in Ice they bring a glacier over to their island to cool themselves down and get water. Text to Self- When I was younger my friend Stephen broke his leg. When we went place he was just wheeled around. There was a time when all of our friends wanted to go on a bike ride so I came up with the idea for strap his wagon to the back off a bike. Just like in the story we were creative so everyone could have fun. Text to World- In history, there was a river that need to be stopped since it was going to run over a town. The town also need energy and the Hoover Dam was born. The style of art in this book is right up my alley. I usually have some appreciation for a book that looks like it's already been around for a few years (I felt the same way about last year's A Sick Day for Amos McGee).I shared this with my husband and he said, "Huh, interesting," which is a pretty lengthy response from him for a children's book. At first I gave this book a three because I thought the narrative was just blah, but then the book started making me think, all #hatback style, about whether I thought the pigs were being industrious or whether they were sticking to a totally inefficient system. Read it and talk with me about it, please. This is a really delightful and whimsical wordless picturebook. I love wordless books because you and your fellow readers can make up whatever back story and narrative you want. This book, while basically a story about some pigs living on an island who build an aircraft that carries them to the North Pole to fetch an iceberg, lends itself so well to storytelling. Why do they need ice? What will they do with it? What happens when it all melts? What will they do with their airship? Great food for discussion and retellings. I love the detail in Geisert's picture books - you can go through them multiple times and catch new details with each read. This one wasn't quite as fantastic as Lights Out or Hogwash, but still a must-read for fans. When the pigs on an island need to find a way to cool off, they set sail in search of ice. They tow an iceberg home, and then slice the ice into bits to use in various creative ways to keep themselves cool. This wordless picture book pays tribute to the pigs' ingenuity and determination to solve their problems. The illustrations, rendered as etchings, show the pigs' air and sea travel and clever inventions. My appreciation for this title has increased each time I have read it. A wordless picture book starring Geisert's adventurous pigs. To be honest, took me a 2nd read to get the full story. VERY detailed drawings that make it easy to miss something. The artwork also is very classic which gives the book an old school feel. I want to like it more than I actually did. Wordless, horizontal-format, minutely detailed story of an island of pigs who are suffering from the heat and find a creative way to get some ice. This one is worth some study! Would be a great tie-in to a cooperation theme or narrative skills (telling your own story to go with the pictures, including the small stories within the large one). Picture books are always a tricky thing in my world. Will I care what's happening in the illustrations? Will I be able to even tell what's happening in the illustrations? Will I be clever enough to put together a story in my own head?Well, as far as this one goes I can proudly answer yes to all three! I have to admit that the plight of the pigs appealed to my life as a Floridian. It was a nice book. My kids weren't into it (mostly 2.5 - 4 year olds), but I think it would be a cool book for elementary school kids. I'm thinking of using it as a writing prompt for a college-aged student. Ice reminded me more of a graphic novel than a picture book. The artwork is done in a minutely detailed, antique style that is reminiscent of something out of the Art Out of Time comics collection. Love those ingenious pigs Geisert specializes in. Good book to introduce children to the ideas that people didn't always have ways to cool down before refrigeration, and as a way to think about problem-solving. This wordless picture book was interesting. You really have to spend some time with the pictures to enjoy the story, but once you do it is worth it. I love the concept of hot pigs transporting ice from an iceberg to cool off. Very imaginative. This is an odd little book, and all I can think of when I read it is global warming, so I can't say it was a lot of fun. But the detailed illustrations are enjoyable, as is putting the pieces of the story together. Arthur Geisert - Arthur Geisert grew up in Los Angeles, California, and claims not to have seen a pig until he was an adult. Trained as a sculptor in college, Geisert learned to etch at the Otis Art Institute in Los Angeles. Geisert has published just about a book a year for the past thirty years. Every one of his books has been illustrated with etchings. His work has appeared in The New Yorker and The Horn Book Magazine. In 2010 his book Ice was selected as a New York Times Book Review Best Illustrated book of the year. Geisert currently lives in a converted bank building in Bernard, Iowa.